If we have noticed one thing among our Illinois drivers, it’s that many of you seem to think that the mid-size sedan has to be a boring car. 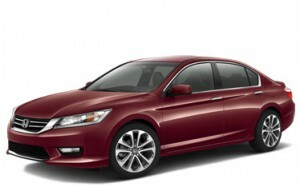 The 2015 Honda Accord Sport says otherwise, though. Available now at our Central Illinois Honda Dealers, the Sport is a step up from the entry-level 2015 Accord LX, giving you a few nice accents and a bit of extra power. Priced starting at $23,865 (MSRP),* the 2015 Accord Sport is just a small upgrade from the $22,105 (MSRP)* of the 2015 Accord LX, and we think you’ll agree that it’s worth the price. You’ll also find an easy-to-grip leather-wrapped steering wheel, a 10-way power-adjustable driver’s seat with lumbar, 18-inch alloy wheels, and a body-color rear decklid spoiler. Bluetooth HandsFreeLink to wirelessly connect your smartphone for audio streaming and handsfree phone calls. SMS texting and Pandora internet radio capabilities make it like your phone and your Accord are one. Honda’s i-MID infotainment system with 8-inch touchscreen to easily manage all of your tech in one place (with convenient steering wheel-mounted controls). Built-in rearview camera with guidelines that makes short work of backing up and parallel parking. Put simply, the Accord Sport takes the Accord LX and gives it a little something extra, and we’re glad we can offer a sportier sedan to our drivers. The 2015 Honda Accord Sport is proof positive that your mid-size sedan doesn’t have to be boring; see it for yourself at a Central Illinois Honda Dealer near you. We’d love to put you behind the wheel for a test drive. *MSRP excluding tax, license, registration, $820.00 destination charge and options. Dealers set their own prices. **Based on 2015 EPA mileage ratings. Use for comparison purposes only. Your actual mileage will vary depending on how you drive and maintain your vehicle.